Hello my fellow Moonies! 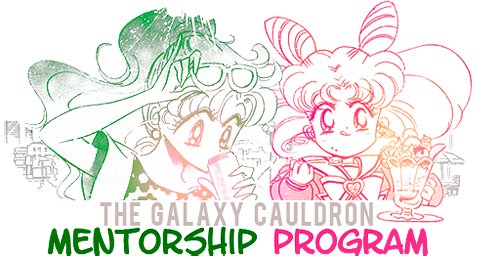 After a short hiatus, the GC's Mentorship Program is back ^^ As you can see, as our beloved Galaxy Cauldron grows, there are many places, games, contests and events that are always going on. Here is your opportunity to sign up and get a Moonie Mentor to assist you during your stay here, navigate the forums, introduce you into chats or threads if you are shy, grow as a Moonie and help you feel like you are not alone on this busy forum. ●► Reply to this topic if you want to sign up.●► You will be paired by me, Sailor Jupiter, with one of our senior members, a Lotus Crystal.●► Once you get your Mentor, you will receive a PM from them introducing themselves. Feel free to talk as much as you want with them! Share your feelings, concerns, questions and whatever else.●► Any Star Seed may be a Mentee, but once they become a Pyramidal Crystal, they will be moved to the Raised list and no longer considered a Mentee. ●► You are more than welcome to PM me as well, your Members Director, if you are having any concerns or questions about being a Buddy. This includes if your Mentor goes inactive; in the given case, contact me as soon as possible so I can re-assign you an available Mentor.●► Click here to check the list of Mentees and Mentors. ● If you signed up in the previous thread, and you're still interested in having a Mentor, please reply to this topic again. ● If you are still in contact with your Mentee/Mentor, say so here. Location : California during most of the year! I request the services of a mentor, please and thank you! I am still in contact with Tuxedo Mistress. I'd like a mentor, please~ Thank you! Can I have another buddyyyyy? I would love a mentor, please? Your Mentor should be pm'ing you soon dear. I think I'd quite like a mentor! Sailor Jupiter, I would like to sign up like you recomended I do.... if possible, id SOO LOVE to be mentored by Pluto..... but ill be able to cope with whoever you buddy me with. Again, how do I pm somebody.???? Avatar by Sailor Candy and Signature by Lust. Just go down to where it says "Contact User" and click private message! If you have any other problems, feel free to message your members director Sailor Jupiter or even myself and we will be happy to assist you! Could I get a mentor too?